Imagine your favourite characters coming to life in your own room, right in front of your eyes! By seamlessly integrating design with latest technology, we engaged with Welspun one of the world's largest textile makers for the design, development and implemention of Spintales – a new line of products that launched in 2016 with a patented Augmented Reality storytelling technology. SpinTales, the first brand under a wholly owned subsidiary of Welspun called TILT Textiles, launched the SpinTales Enchanted Duvet and SpinTales Jungle Rug. The Duvet and Rug are interactive and innovative textiles for kids, age three and up. 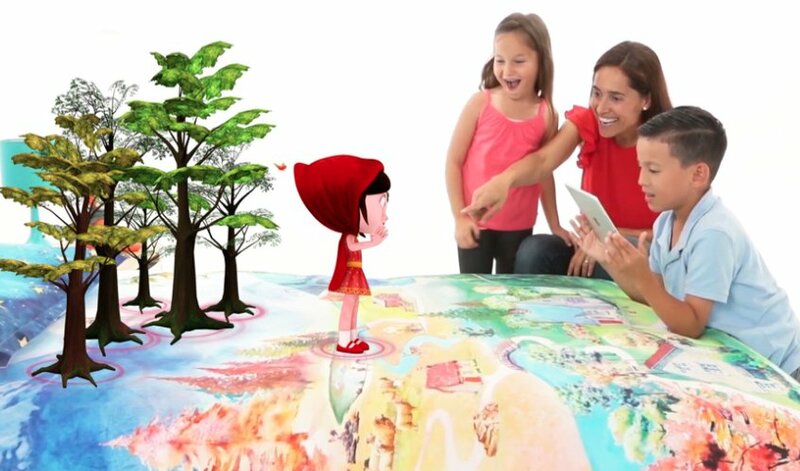 By scanning the specified markers on the rug or duvet (using a tablet or smartphone) children can view characters in Augmented Reality. It feels like you are part of their world and you learn a bit more about the world they live in. SpinTales is the first of many experiences that will be introduced and launched by TILT. To ensure the experience is uniquely interactive for both children and parents, we ensured subtlest aspects were considered while fostering a learning environment with innovative and futuristic textiles. SpinTales was showcased in the CES 2017. The stories and content developed by Tata Elxsi’s creative team are inspired by stories that kids already know and love: Little Red Riding Hood, Jack and the Beanstalk, The Three Little Pigs and Jungle Book. Since launch it has received 75 million + media impressions from technology, lifestyle, toys and media. Recently Tata Elxsi's work was recognised with 'CII Design Excellence Awards' for Interaction Design.